Like most cruising sailors, I'm a big fan of roller reefing (or roller furling) headsail systems. 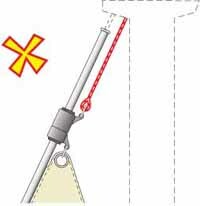 Not only are they a convenient way of getting rid of the jib at the end of a passage, they enable us to easily adjust the headsail area to suit the prevailing conditions. And whilst it's undeniably true that a partially furled genoa will never be quite as efficient as a hanked-on jib of the same size, for the cruising sailor the small performance loss is balanced by convenience and safety offered by roller furling systems. I suppose some gung-ho types revel in changing foresails in the dark on a pitching foredeck in a rising gale. I don't - never did, come to think of it - and don't know anyone who does. So to all manufacturers of headsail roller furling gears - thank you! 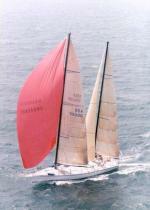 Some roller furling systems (like those shown here) incorporate a double swivel arrangement which puts a full roll into the middle of the sail before the rotation is taken up by the head and the tack. This goes some way towards removing the fullness that would otherwise be present in the partially rolled sail. Sailmakers have done their bit, too, by building a foam insert into the luff which similarly flattens a partially rolled headsail. But it has to be said that whilst this improves the sail shape, the bulking of the sail around the foil disturbs the airflow over the luff of the sail - which can only reduce drive. Modern roller furling systems are very reliable and require little maintenance; hosing them down with fresh water regularly to flush out the salt from the bearings is all that's needed. 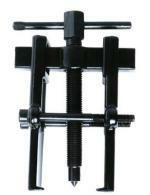 The most common problem is not one of equipment failure, but one of incorrect set-up. If the luff of the sail is much shorter than the foil, the halyard can - and according to Murphy, undoubtedly will - get twisted around the foil comprehensively jamming up the works. 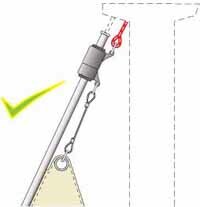 Prevention is quite simple - a short wire strop between the top swivel and the head of the sail. Now the exposed length of the halyard is too short to wrap around the foil, and will prevent the top section of the swivel turning. motor the sailboat around in tight circles, passing the coil around the forestay until the sail is furled. Deck-sweeping genoas are not wonderful on a cruising boat if you're at all interested in what's going on ahead; nor do they work well with furling gear unless you're happy to move the mainsheet traveler every time you adjust the furler. It's a geometry thing, the jib sheet must pull equally along the foot of the sail and the leech, or the shape of the sail will be distorted. when all tell-tales break at the same time, then you've got the car in the right position. 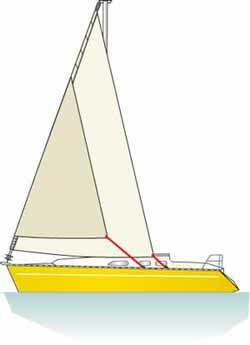 You'll find that a sail with a higher clew, like a yankee in a cutter rig, will enable the headsail to be rolled progressively without having to adjust the position of the car. Whilst on the subject of cutters, my choice is not to have a roller furling gear on the staysail. If you stick with a hanked-on staysail, it can be easily replaced by a hanked-on storm jib when conditions demand it. And whether you sail in arctic waters, the tropics, or anywhere in between, a sacrificial strip is essential to protect the sail from UV damage when fully furled. The roller furling technology has crept into mainsail systems, and much less successfully in my view. There are two approaches to this - in-mast roller reefing systems and in-boom roller reefing systems. I reckon there's nothing wrong with the simplicity of slab reefing and lazy-jacks. Even on boats of 45 feet and above, the difficulty of hoisting a heavy fully-battened mainsail can be overcome by an electric winch, and with all lines lead aft slab reefing can still be feasible. A pal of mine sails his Sundeer 64 singlehanded without undue drama using this approach, and wouldn't have it any other way.